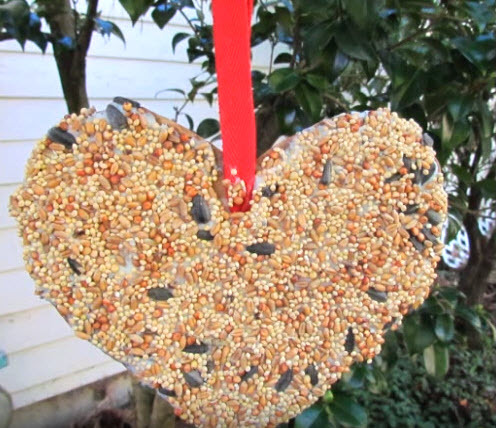 Make a heart-shaped bird feeder as a Valentine’s Day gift for your birds! Cut a piece of cardboard into the shape of a heart and poke a hole at the top of the heart. Thread festive ribbon through the hole to hang the feeder in a tree. Spread a layer of peanut butter or lard over one side of the heart, cover a plate with bird seed, then press the peanut butter-covered side of the heart into the bird seed until the peanut butter is completely covered. Repeat the process to cover the other side of the heart with birdseed as well.